Seller will give you a gift certificate in the amount of 2,7143 RUB for a positive review of the product purchased. By purchasing this product, you immediately get a key from the payment of World of Warcraft: Battle Chest US + 30 days of the game, which includes classic WoW edition and additions The Burning Crusade, Wrath of the Lich King, Cataclysm, Mists of Pandaria, Legion and Warlords of Draenor! 1. The primary key for 30 days. 2. The key to the guest 10 days (activated only international credit card). Please note that registration for the game account you necessarily need an international credit card or payment card playing time for 60 days - World of Warcraft Time Card 60 Days (US version.) If you do not have a credit card and you prefer to pay for the game only with time cards for 60 days (World of Warcraft Time Card), you must register a new account directly from the primary key for 30 days. You only get a digital copy of the key with instant delivery. 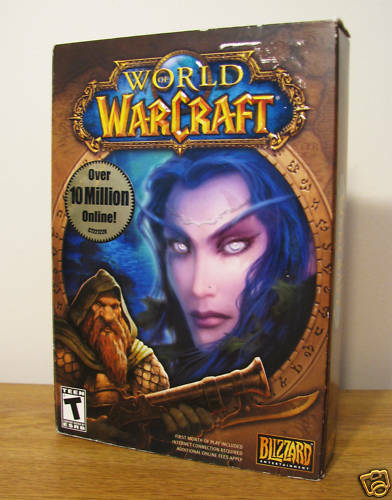 Must be installed on the computer game World of Warcraft (US version), an exception may be only the cases, if you play in internet clubs or internet cafe, where the game is already installed or you have an opportunity to take a drive with the game installed on a computer at their friends. See you in the world of World of Warcraft! it is important for buyers and our further work, and you take a little time. For example, short words will suffice OK ;-) Just click the mouse in the window in front of your purchase with us and write a review. For our part, we will appreciate your positive feedback present size of $ 0.5, which we´ll credit your account in Webmoney or which give an additional discount when making purchases with us. Check out the whole list of codes can be sold on http://warcraftbest.plati.market/. Seller will give you a gift certificate in the amount of 2,7143 RUB for a positive review of the product purchased..